MISSION, KS--(Marketwired - Dec 5, 2013) - (Family Features) Strawberries are a quick and easy snack for adults and children. It's no wonder why they're a top fruit juice in kitchens and lunchboxes everywhere. Plus, these tasty fruits are packed with almost 140 percent of immune system boosting vitamin C.
"Strawberries always put a smile on my face," says Chef Justin Timineri, executive chef and culinary ambassador, Florida Department of Agriculture and Consumer Services. "My favorite recipe for them is to simply 'Rinse, eat and repeat.'" 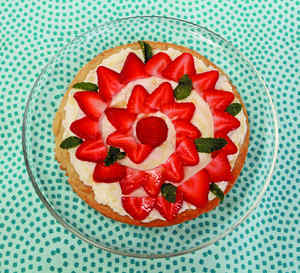 You can find more snack ideas and recipes at http://bit.ly/floridaberries. Choose strawberries that are plump, fragrant and firm, with no signs of bruising or leaking. It's best to eat strawberries on the day of purchase. You can freeze strawberries by hulling, lightly washing and drying them. Arrange in a single layer before placing in the freezer. Never hull strawberries until after they have been washed or they will absorb too much water and become mushy. Sign-up to receive a FREE copy of the"Kids in the Kitchen" cookbook at: http://bit.ly/flfffkids. To make crust, cream together butter and sugar with mixer until fluffy. Add egg, baking powder, salt and vanilla extract until mixture is smooth. Add flour and mix until smooth dough is formed. Place finished dough in between two sheets of wax paper and refrigerate for 20 minutes. Remove from refrigerator and roll dough out to 1/4-inch thickness and in round shape. Place dough in greased 12-inch pizza pan and bake in preheated 350°F oven for 25 minutes or until crust is light brown. Cool completely. To make topping, combine cream cheese, honey and sugar until smooth. Spread evenly over cooled cookie crust, leaving 1/2-inch border uncovered. Place sliced strawberries around outside border; fill in middle of pizza. To make glaze, combine honey and water; brush over top of finished pizza. Kids Can: Glaze top of finished pizza. Place sliced strawberries on top of pizza. Grown Up Alert: Adults should help with oven. Put everything but fruit into blender; blend on low, gradually increasing speed. Once smooth, add fruit and finish blending until completely smooth. Pour into tall glass and enjoy. Cut stems off strawberries and carefully scoop out 2/3 of inside with knife or spoon, creating a cup. Be careful not to make any holes. Cut piece off bottom tip of strawberries to allow them to stand up. Beat cream cheese and yogurt until fluffy. Fold in vanilla extract. Working in batches, place cheese mixture into pastry or sealable bag with small corner cut off. Fill strawberries with cheese mixture. Garnish with mint and serve. Kids Can: Place cheese mixture into pastry bag and fill strawberries. Grown Up Alert: Adults should stem the strawberries. Combine strawberries and 1/2 cup sugar in small bowl. Set aside for 1 hour. Drain and reserve liquid and strawberries separately. Preheat oven to 425°F. Combine flour, baking soda, nutmeg and salt. Set aside. Mix eggs, butter, vanilla extract, remaining sugar and liquid from strawberries in medium bowl. Add flour mixture. Stir until combined. Fold in reserved strawberries. Spoon into 12 greased muffin cups. Bake for approximately 20 minutes. Serve warm. Kids Can: Spoon mixture into muffin cups.